Damon Berryhill's Manager of the Year award wasn't enough for the skipper to keep his job. 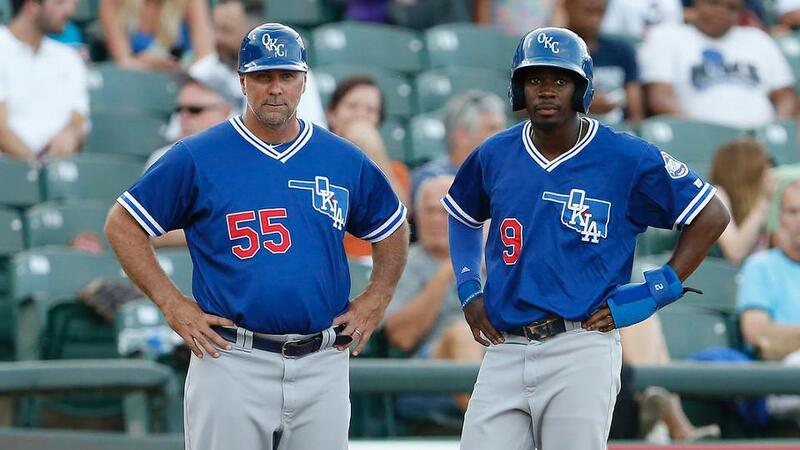 Berryhill, who led Triple-A Oklahoma City to an 86-58 first-place record -- the best in the Pacific Coast League -- a division title and a playoff appearance, was one of nine managers, coaches and instructors fired by the Dodgers this week as Los Angeles continues to revamp its farm system. A 10th coach is reportedly out as well. According to MLB.com's Ken Gurnick, the Dodgers declined to renew contracts for Berryhill, Double-A manager Razor Shines, Arizona League Dodgers skipper Jack McDowell, Oklahoma City hitting coach Franklin Stubbs, Great Lakes coaches Glenn Dishman and Angel Sanchez, Ogden hitting coach Darryl Brinkley and Minor League instructors Rick Rhoden and Erik Bedard. According to the Tulsa World, Great Lakes coach Jay Gibbons also will not be invited back. Gurnick said the Dodgers have not yet named replacements. "All our Minor League staff put forth a tremendous effort in 2015, and we appreciate all their work and dedication," said Gabe Kapler, the Dodgers' director of player development. "At this moment in time, we wanted to bring in some new voices in some key areas. Our changes should not be viewed as a reflection on any performance; they simply reflect that we are heading in a different direction." Berryhill was voted by his fellow managers as the PCL's best manager on Sept. 4. He guided the Dodgers to the American Northern Division title and the best record in the league, despite a constantly changing roster that included more than 300 transactions from Los Angeles. Berryhill's 86 wins set a new franchise record in Oklahoma City. The 51-year-old joined the Dodgers as a manager in 2009 after working for the Angels, D-backs and Rangers from 2002-08. Before that, he spent 10 years as a catcher in the Majors. Shines' Double-A Tulsa squad finished last in the Texas League North at 62-77 this season, going 29-39 at home. "It was disappointing," Shines told the Tulsa World. "I wanted to give the people in Tulsa the championship they deserve. I enjoyed working for the Dodgers and being in Tulsa." "We're going to miss him," Tulsa general manager Mike Melega told the newspaper. "I wish we could have had him for more than one year, but that's the game of baseball. We know he'll be successful wherever he lands." The moves came on the heels of the Dodgers firing a dozen international scouts in August. "Baseball has been very good to me, and I really love developing players," Shines added. Stubbs, 54, won a World Series with the Dodgers in 1988 before seeing time in the Majors with the Astros, Brewers and Tigers through 1995. McDowell, 49, was a three-time American League All-Star who won the AL Cy Young Award in 1993 with the White Sox. Nicknamed "Black Jack," the former right-hander spent 13 seasons in the Majors with Chicago, the Yankees, Indians and Angels. He was hired by the Dodgers in January 2014. Gibbons, 38, spent seven seasons in the Majors with the Orioles from 2001-07 before resurfacing with the Dodgers in 2010. He was hired as a coach by the Dodgers earlier this year. Bedard, 36, signed a Minor League contract with the Dodgers on Jan. 18, but strained his back in Spring Training and failed to make Los Angeles' Opening Day roster. He made three starts this year for Class A Advanced Rancho Cucamonga before retiring on June 11.